Domaine Yves Bazin is located in Villars-Fontaine in the Hautes Côtes de Nuits area, close to Nuits-Saint-Georges. Our vineyards are exposed to the South or South-West on hillsides. We benefit from a microclimate and our vineyards draw from the soil deep under-ground to give each of our wines the best of the terroir. 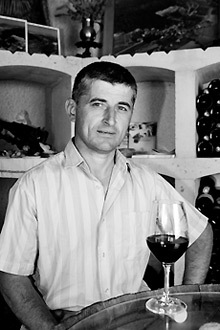 By taking on his parents’ farmstead, Yves Bazin created Domaine Yves Bazin in the early eighties. From one and a half hectare originally, he nowadays works eleven and a half hectares with his wife and his daughter Madeline, resorting to seasonal workers for grape-harvesting and various wine-growing jobs. Our year production is now between 550 and 670 hectolitres. 7 45 hectares in Villars-Fontaine, 14 acres in l’Etang-Vergy and 1.82 hectares in Villers-la-Faye and 1.92 hectares in Segrois. Our vines are tall and wide, with row spacing of 10 feet (3 metres) and in-row spacing of 3 feet (1 metre). This method of culture appeared in the early 1970’s, originally to minimize spring frosts – as grapes grow from 2.5 feet to 3 feet above the ground, they are less exposed to dew and the widely spaced-out rows allow them to drip dry faster. This method was also chosen to better hillside vineyard working, because vineyard width allows tractors to be used, and their height avoids backache in manual jobs. To avoid erosion, natural grass growing is practised, controlled by ploughing and mowing so that various wild flowers and plants may be found, with even a few morels (“morillons”) at times. Our visitors living close to these places, whose addresses we know, will be forewarned personally about a fortnight before the fair. We also organise grouped deliveries for Yuletide.